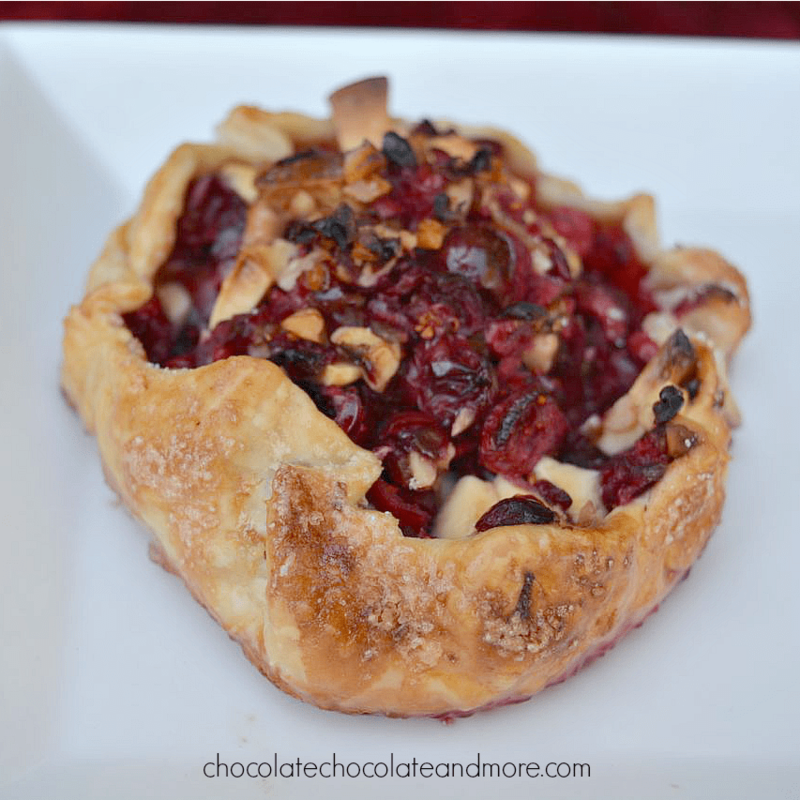 Cranberry Walnut Galette - Chocolate Chocolate and More! 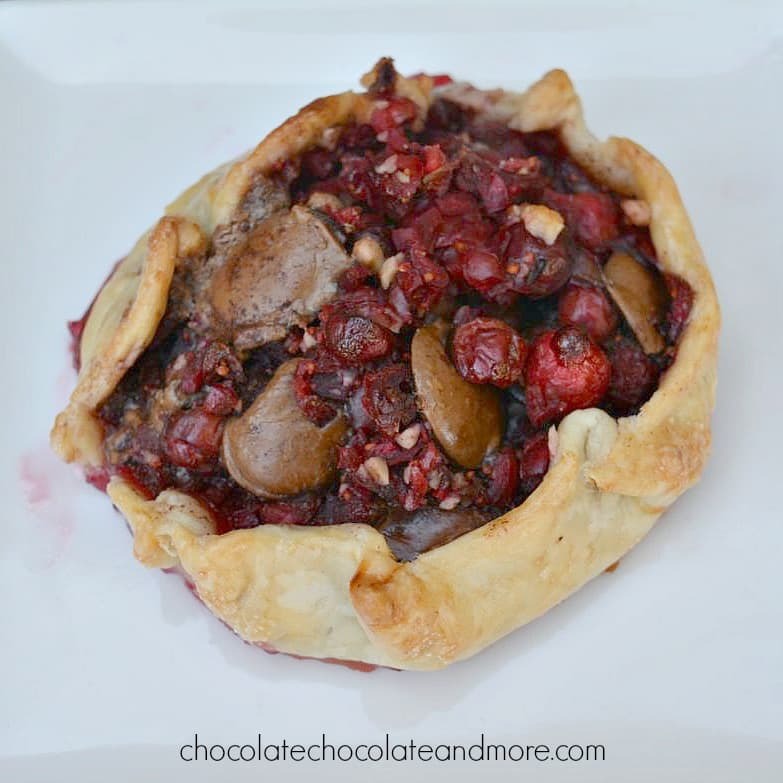 Cranberries, walnuts and your choice of chocolate make this Cranberry Walnut Galette a versatile and easy make-ahead dessert for your fall gatherings. This has been a mixed week for me. My car broke down but I was able to get it to the mechanic before it completely died. I’m waiting for the phone call where the mechanic tells me how much damage this will do to my wallet. On the bright side, Costco had fresh cranberries so I started stocking up and the pie class I took at Sur La Table featured a rustic cranberry tart. The tart we made was pretty simple but it lacked chocolate. How could they? The chef also pointed out how restaurants are going to individual pies because slicing pie neatly is not so easy. I thought why not make individual galettes and change them up a little for different guests? The base recipe will make 4 plain cranberry walnut galettes. I’ve added ingredient amounts to make two additional kinds: white chocolate ginger and milk chocolate cinnamon. If you want all of them to be the same, multiply the additions by 4. 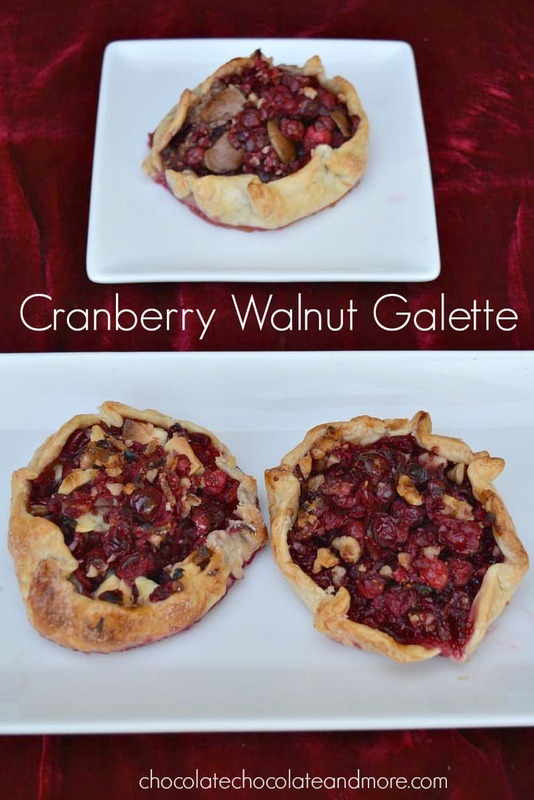 The other great thing about this cranberry walnut galette is they freeze well. So you can make them ahead, keep them in the freezer and then pop them out when guests arrive. One of the variations I made uses milk chocolate and Vietnamese Cinnamon from World Vision. I learned about World Vision’s many programs when I was in Cambodia. World Vision focuses on the poorest children in Cambodia through nutrition and education programs. Many poor Cambodian children are sold by their families into slavery and prostitution so I can’t tell you how important this work is. When World Vision asked me if I’d be willing to host a giveaway of their crafts to raise awareness of their work, there was no question in my mind. Part of the funds from craft purchases go to the artisans and the rest goes to World Vision projects. It’s holiday shopping with meaning. World vision is also working to abate poverty in America so you can give gifts that help America’s poor as well. 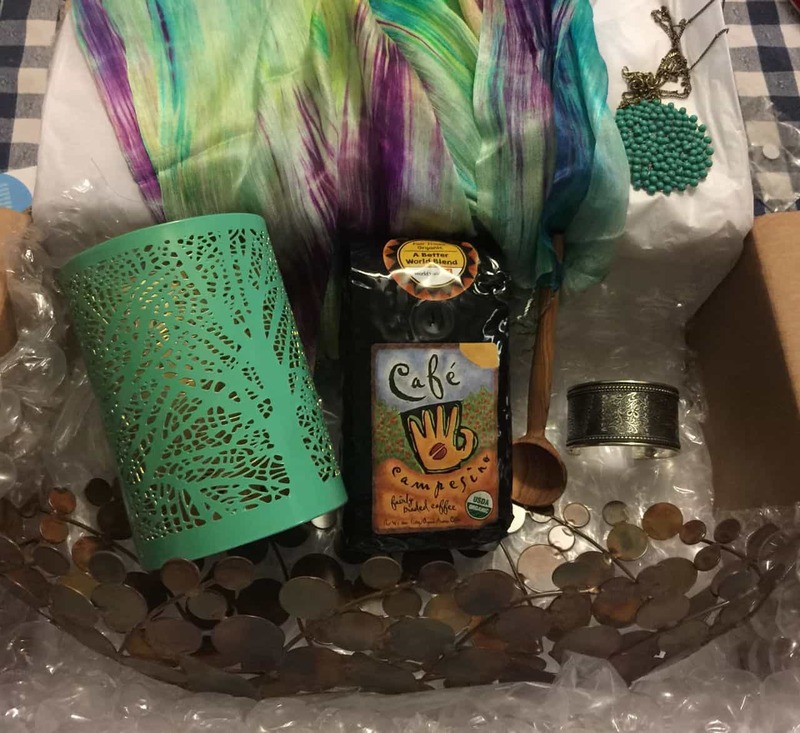 Our giveaway basket includes a Vietnamese silk scarf, a silver vines cuff from India, a tree of life votive holder, an upcycled artisanal bowl, a turquoise medallion necklace, and organic coffee. Each of these makes a wonderful gift for the special people in your life. The giveaway will run until November 14 and you must live in the United States to be eligible. In addition to the basket, I’ll be giving away some of the items from the basket they sent me. Put 1½ cups of the cranberries in a food processor and pulse until coarsely chopped. In a medium bowl, mix the chopped and whole cranberries with the remaining ingredients for the filling. If you want to make all four variations, divide filling into fourths and put each fourth into separate bowls. Add ingredients for each variation to one of the portions and leave the fourth plain. Set aside. Divide your pastry crust into four equal portions. Roll each portion into a circle about ¼ inch thick. Place circles on a parchment paper-lined baking sheet. Brush the outer edges with egg wash. To make the egg wash, whisk together a whole egg and 1 tablespoon water. Heap filling in the middle leaving 1½ inches around the edges. Fold the edges up and pinch them together to make a bowl-like pastry. (I put the solid part of the filling in, then folded the edges up and then drizzled the liquid in the middle). Brush the outside and sprinkle sugar on it. Freeze for 1 hour or until ready to bake. Bake for 10 minutes at 425°F and then for 10 minutes at 375°F (or until golden on the outside). To freeze these, store them in a tray in your freezer until frozen and then place in a ziplock bag until ready to bake. This is a refreshing combination for the galette: one of those must do ASAP. Thank you ! Thanks so much. I hope you enjoy them! I like the idea of the white chocolate ginger and the milk chocolate cinnamon. Although I like anything chocolate. It is my weakness. I am glad that portions of the World Vision items go to the people making them. From the few I saw the craftmanship is beautiful. I love the work World vision does. The items I received are lovely so I hope you win!